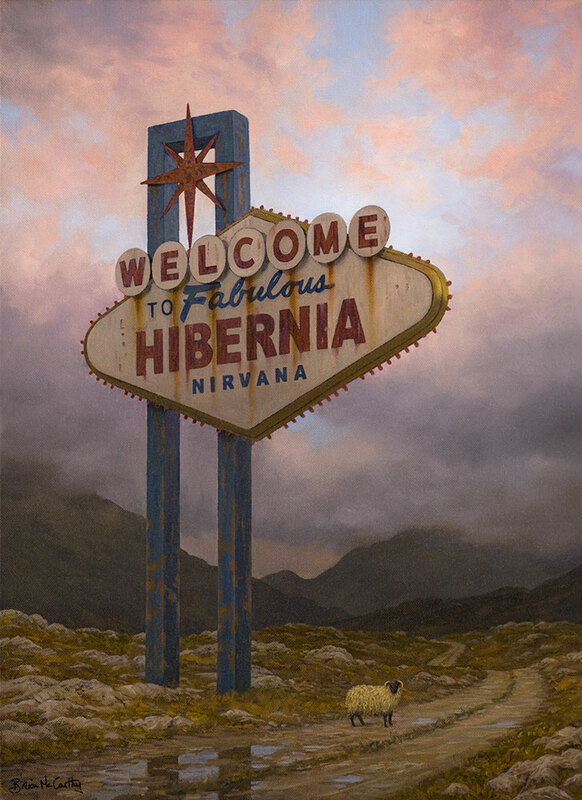 A lone sheep on a mountain track beneath a dilapidated Las Vegas style sign advertising Hibernia; a mother and daughter face a city in flames, as the giant figure of Justice looms out of the darkness; a group of conspirators dance beneath a giant flag by a quayside, as the lights from office windows of banks twinkle ominously late into the night. These are images from Brian McCarthy’s compelling collection ‘Boomtown’, which should appeal to the readers of Ireland After NAMA, for their observations on issues of economy, society and nationhood, in this unprecedented period of crisis and turbulence. As the behemoth NAMA lurches on, cloaked in secrecy, McCarthy’s vision captures the mood of a society stretched between rage and bewilderment, whose memories of betrayal burn and who in spite of the mantra of corporate Ireland, cannot and will not ‘move on’. 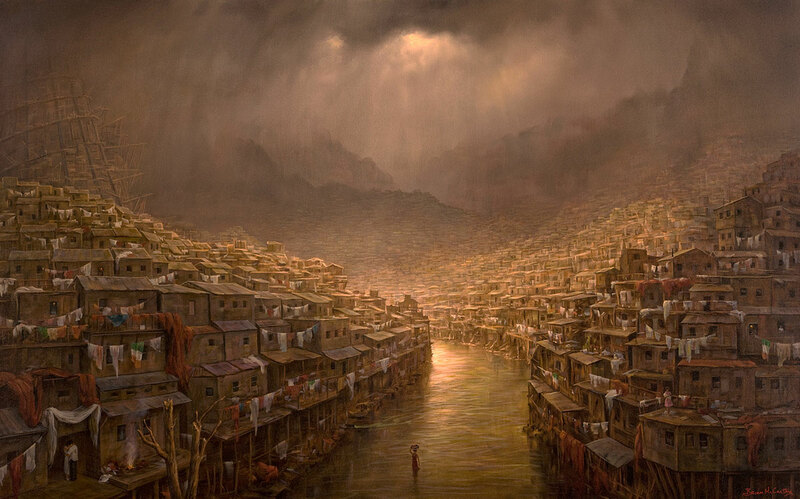 In his signature image ‘Boomtown’, McCarthy presents a crowded landscape of slum-like dwellings, cramped together on the hillsides, overlooked by an unfinished Tower of Babel. The allusion is towards the Favelas of Latin America, but this landscape seems also to be a striking observation on the ruinous capacity of over-development. This dense landscape seems moored in despair. The Tricolor hangs from the balconies of houses. The flag is a constant motif running though his collection – you see it on emigrant’s boats, or rising up from the street in preparation for revolution. 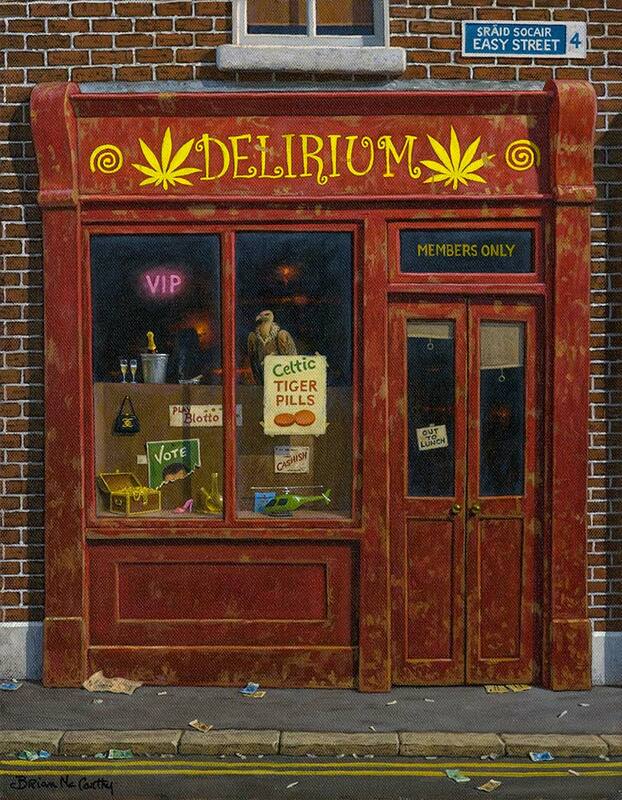 In ‘Delirium’ – another telling image – a prosaic Dublin shop-front is transformed into a Head Shop. Remember them? This shop sells Celtic Tiger Craic Pills. As a comment on the character of the Irish Banking Sector and the practice of excess, it sums things up more clearly than the Nyberg Report on Banking Sector. He pictures money blowing up the street – like the credit that littered the Irish landscape with empty and unbuilt houses. McCarthy’s use of magical realism constructs a counterfactual landscape that is deliberately antagonistic to the spectacle and narratives of the boom-time. The technique provides a sophisticated mode of social inquiry, observation and analysis. This kind of art sets out to disrupt what Guy Debord once called ‘…the existing order’s uninterrupted discourse about itself, its laudatory monologue.’ Those carefully crafted images of Ireland –monetized by Culture Ireland, Bord Failte and the IDA – are dealt a sharp blow by his critique.